The Portland collection by Globe Electric is a stunning way to add vintage glam feeling to your home. The classic globe shape is accented with a vintage brass finish and a glamorous white frosted glass shade to bring a wonderful warm glow to any location. The Portland Floor Lamp goes well in any room and is best suited for a living room, dining room or bedroom. The soft pleasant glow is a perfect ambient light, yet a radiant 60-watt bulb creates a great task light for any space. The clever design has an adjustable rod that houses the shade so you can point the light where you need it most. Requires one E26/medium base 60-watt bulb (sold separately). Retro-Industrial design positioned to please. The 'antiqued,' bronze finish arm of the Counter Balance Floor Lamp is equipped with a clear, stepped glass shade (Retro Edison bulb included). The multiple adjustment points offered by the Counter Balance Floor Lamp reward your home or office with ideal directional lighting. Its quality construction ensures years of functional durability. Updating the lighting fixtures in your home is the most effective way to accomplish a striking, yet simple, Do It Yourself (DIY) remodel. 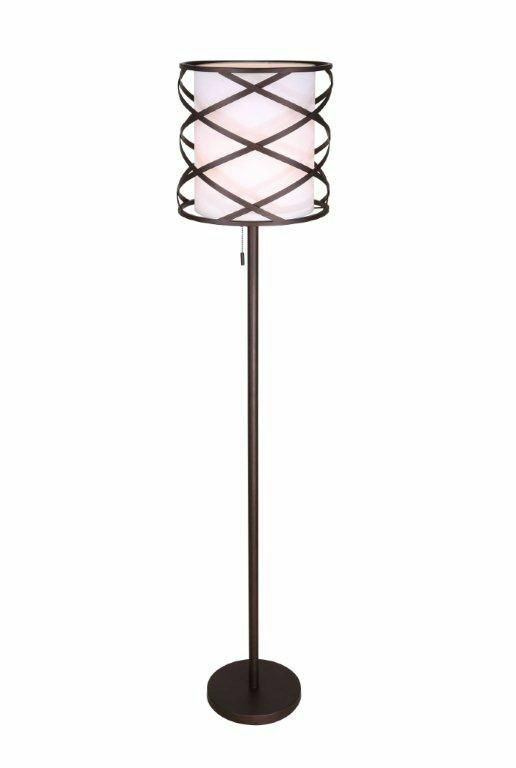 Carlina 1 Light ORB Floor Lamp The CARLINA floor lamp features an oil rubbed bronze finish with a white fabric shade. The unique caged design adds extra appeal to this lamp and is perfect for your living room and bedroom. Carlina 1 Light ORB Floor Lamp is rated 4.5 out of 5 by 2. Rated 5 out of 5 by jetray from Very decorative. I just bought this a few days ago and it fits perfectly with our décor. I love the looks of it and it is sturdy. It does give a fair amount of light too. Rated 4 out of 5 by Anonymous from Yes they are tippy! I love the look and style of these lamps. They also give off very nice light. However, they are very tippy which I was concerned about before bought them. My young kids have knocked them over and part of the screwing mechanism for the shade and bulb broke easily. Thankfully they are still usable and I now tuck part of the base under my couch to stop a fall. That has worked so far. mine are on carpet so the stability may be slightly better on a solid surface (although the table lamp also tipped over). So overall I love the actual product, but the durability/style is not ideal in a busy house. Why is there no description of the item? I need to know the dimensions, what is the maximum wattage of bulb used and what color/kind of metal.